Prehistoric Caveman Figure. Size 3.25" The art work and details are beautiful on this hand painted figure. 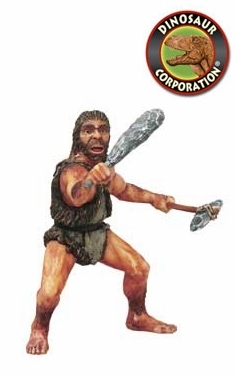 A caveman or troglodyte is a popular stock character based upon popular concepts of the way in which early prehistoric humans may have looked and behaved. The archetype of "cavemen" originates with the discovery of Neanderthal remains. The term caveman, sometimes used colloquially to refer to Neanderthal or Cro-Magnon people, originates out of assumptions about the association between early humans and caves, most clearly demonstrated in cave painting. Caveman-like Heraldic "wild men" were found in European iconography for hundreds of years. During the Middle Ages, these creatures were generally depicted in art and literature as bearded and covered in hair, and often wielding clubs and dwelling in caves. While wild men were always depicted as living outside of civilization, there was an ongoing debate as to whether they were human or animal. Cavemen are portrayed as wearing butty animal hides, armed with rocks or cattle bone clubs, unintelligent, and aggressive. Cavemen are often shown as living in caves, possibly because that is where the preponderance of ritual paintings and artifacts have been found. Although it is probable that Neanderthals and early humans lived elsewhere as well as in caves, artifacts proving this would have been destroyed over millennia, while that which had been left in caves survived to be discovered. Nevertheless, expressions such as "living in a cave" have become cultural metaphors for a modern human who supposedly displays traits of brutishness or extreme ignorance.